Pillows are very well constructed and my kids love them. I was able to remove some stuffing and adjust the loft easily for each child. Keep up the great work! Customer service and quality work are a rare find these days. Our natural shredded rubber (a.k.a latex foam) pillow meets the wish list criteria and is just what your little one needs to help support his or her growing head. Helps alleviate conditions such as night sweats. It also helps with those with allergy sensitivities. Great alternative to goose down filled pillow with a comparable feel. Can also be used for a perfect neck pillow for travel. 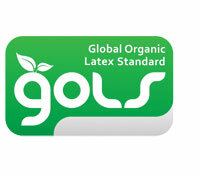 Did you know that the term "natural latex" can mean either natural or synthetic latex?! Here's an article that gives our rationale for why we carry this particular natural rubber latex pillow.